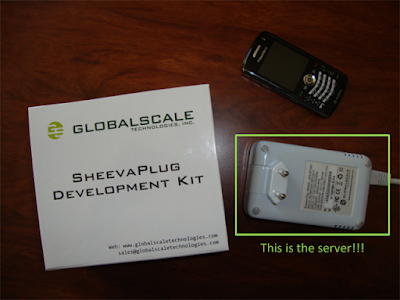 Yesterday I got a SheevaPlug development kit and the first idea that came to my mind was “hey, let’s put a Plastic server here!” I’m involved in a small robotics project at the university (I’m an associate professor in Computer Science, although robotics is not my area) and we’re evaluating different alternatives to use as the robot brain. But yes, before moving some engines I wanted to check if it was possible to set it up as a Plastic server. Well, I just took a few pictures of the “pluggable computer” today, close to my BlackBerry so you can see how small it is. First thing is to go and plug the “thing”. Then it is supposed to start up and get an IP address from your router. That’s what I did, then went to my router configuration and checked that a new box was online! Then I followed the instructions here to connect using ssh and log in. Cool! Again, really simple and well documented here. It’s an old 2.0 Mono (so I will try to come up with a newer 2.8 in the coming days, but just stayed with this one for the initial tests). First thing I hit was that the SQLite libraries installed by default on the box were not ok to work with the Mono wrapper. And it … started up! And then I restarted and everything worked! Can you tell a little more about the SDK, when it is coming, what is contained in it and what should be possible with it?